I see a Company of Crying Companions team book on the horizon. Remember the crying Gorilla from Promethea? 1. Perhaps I am missing something, but there does not seem be a joke here, unlike in the other two covers. 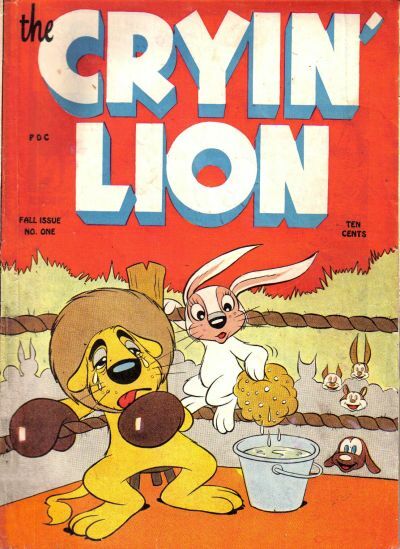 Just a situation (the lion is in a boxing match, which he is presumably losing), not a joke. 2. The way the rabbit is staring straight ahead with a startled expression suggests that something ominous is approaching. If so, there probably should be a stronger indication (such as a shadow). If not, then the rabbit’s expression is a peculiar choice. 3. Rendering the crowd in outline, with a few disembodied heads floating above, makes the scene creepier than the illustrator probably intended. 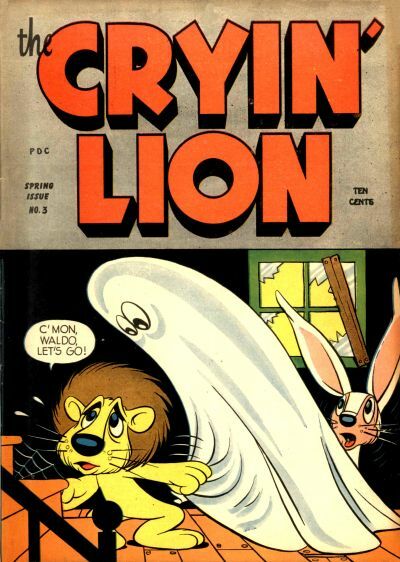 I bet this Cryin’ Lion was inspired by the Cowardly Lion in the Wizard of Oz movie, which had come out only a few years before. Not sure that’s the character from that movie I would have thought would merit a knock-off in a comic book, but what do I know? Turan, I think the joke on the cover of issue #1 is the juxtaposition of a “tough” career like boxing with the obviously meek lion. And yes, those floating heads in the background are weird. Looks like Waldo is soaking up C.L.’s never-ending tears with the sponge, which he is then wringing out in the rapidly-filling bucket. He’s not crying in issue 3. I want to know this character arc. 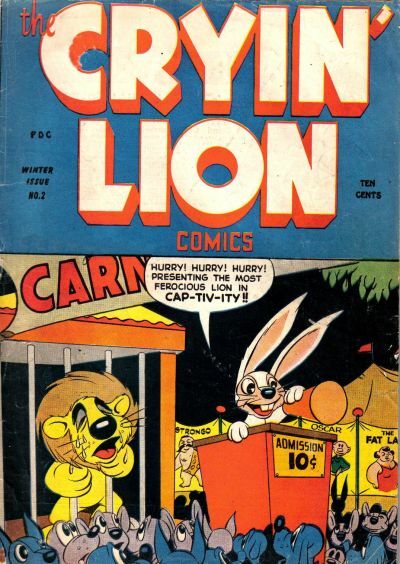 Mike, feel free to take this link down if it’s more hassle than it’s worth(I don’t know how ridiculous the terms of service for your hosting company are), but here’s Cryin’ Lion 02 if anyone is interested. Of course I forgot to paste the link!